HomeThoughts | QuestionsHow to forgive someone who has hurt you. How to forgive someone who has hurt you? We all have times in our lives when we need to forgive someone. Many of us hold onto these hurts and can go years without forgiving someone who has done us wrong. A video on how to forgive someone who has hurt you can be found below. Whether it is someone who isn’t sorry, a friend who has hurt you, someone who cheated on, betrayed, lied to you, or someone you hate, forgiving others is one of the hardest things that Christ asks us to do because it goes against all of our human nature, but I believe there are some things that I’ve learned about forgiveness that makes it easier. I have been hurt many times throughout my life and I have always struggled with the balance of wanting to glorify God through my choices and, being able to let go and release someone of the wrong they have done to me. This is always easier said than done for sure, but it is possible when you consider these things. I have tried to forgive others in my own power and I realized it is just not possible. My flesh screams “Do unto others as they did to you.” This is not the way of Christ but we want people to pay for how they have treated us. Many times we want them to realize how they have treated us and we want to hold onto that hurt and pain so that it can justify many of our wrongs as well. This is why God gives us the Holy Spirit to help us in various situations. I’ve realized that the Lord faithfully answers our prayers when they are to glorify Him. It is His will that we acquit everyone who has hurt us and live a free life in Him. So, when we acknowledge that we need His help to forgive someone, He will help us do that. If you don’t like to read, watch a short video on how to forgive others on our YouTube channel. This has been something that really inspired me and has made it easier for me to forgive. I am so desperately in need of forgiveness every single day but I will not receive it if I do not dish it out. Again in Mark 11:25 it says, “When you stand praying, if you hold anything against someone, forgive them, so that your Father in heaven may forgive you your sins.” Our forgiveness of others is directly connected to our own forgiveness. When we really start to see our sin through the eyes of Christ, we realize that we are no better than the person who has hurt us. All sin causes separation from God and unforgiveness is a sin that is despicable just as much as whatever was done to us. Praying for those who have hurt you can be very difficult, but once you do it, it becomes easier for sure. There is nothing that releases someone and encourages forgiveness like prayer. Read an article on the power of prayer. When you pray that your offender will be blessed in various areas of their lives, you stop wishing for revenge and submit them to God. This is such a powerful step in the process of forgiveness and it brings healing to our own hearts as well. Forgiveness doesn’t mean becoming best friends with that person. It means freeing them of the offense that they did against you. It means giving them to God. It means giving up the right to hurt someone back for what they have done to you. Sometimes forgiveness does mean reconciliation and relationships are mended and healed. There is power in forgiveness and obeying God. Sometimes we do not forgive because we want to hold someone accountable for his or her actions. However, forgiveness is not about letting someone off the hook but about letting yourself off the hook. You experience true freedom when you let go of that offence. Many times the person who has offended us has moved on with their life but we haven’t. We carry unforgiveness into other relationships and it keeps us in fear. Forgiving others sets us free and allows God to work in our lives. Forgiveness is such an amazing thing that brings so much freedom and happiness in our lives if we just obey and trust God. This is a form of obedience to God as He instructs us to do this and even gives us blessings in return. These are the aspects of forgiveness that have made it so much easier for me to forgive others and I hope they will help you as well! 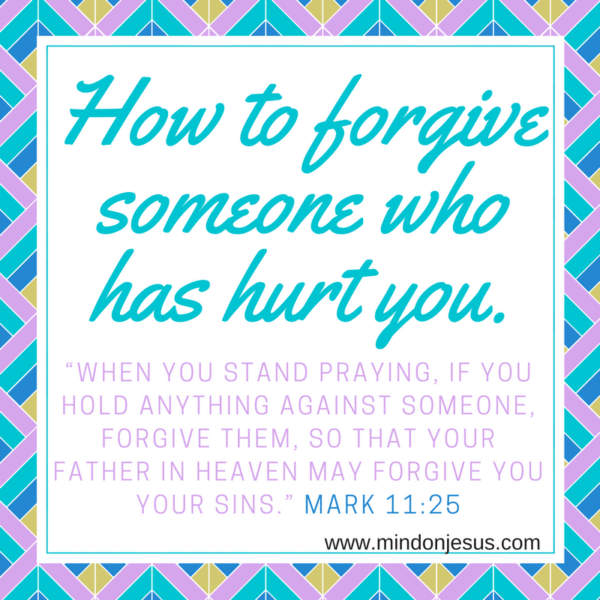 Read about Learning to forgive – Christ Based, and Bible Verses About Forgiveness.